I was recently nominated by my fellow Stay At Home Dad and Dad Blogger friend R.C., who writes at Going Dad, to participate in a challenge called Five Photos, Five Stories, in which I post a photo and story (fiction or non-fiction) daily for five consecutive days. (Note: I had good intentions to do a post on five consecutive days but I chose time with my kids and sleep over blogging. And I’m okay with that.) It sounded like something that would be a fun to share with my loyal readers here on my blog. Today I nominate my friend and fellow SAHD Mike, who blogs at AtHomeDadMatters. My mom is one of those cool moms who loves football. 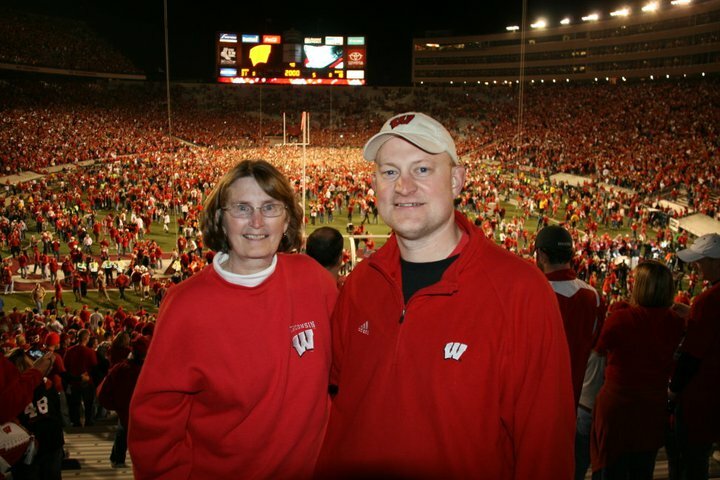 She’s also one of those smart moms who cheers for the Green Bay Packers and Wisconsin Badgers. She’s obviously one of those amazing moms because she had me! (That was a joke. You’re supposed to be chuckling to yourself right now.) To cut (through) the cheese here, my mom is pretty awesome and I love her dearly. While she is pretty cool, smart and amazing, this story is about the first time that she returned to her Alma Mater to watch a football game since her days in college. Like me, she graduated from the University of Wisconsin-Madison, only a few years before me. Unlike me, after she finished her studies at the UW she moved away from Madison and never attended another Badgers game at historic Camp Randall Stadium. Until 2010. My lovely wife received a pair of tickets to a Badgers game and kindly gave them to me because she doesn’t care at all about silly stupid football sports but knew that I would love to take them off her hands. When she told me that she had the tickets she said they were for a game against Ohio State…”are they any good?”. Seriously. In October of 2010, the Ohio State Buckeyes were the #1 ranked team in all of college football. And they were coming to Madison for a Saturday night showdown against the Badgers on national television. It was being hyped as the game of the year in the Big Ten Conference. As I recall, the price of tickets for that game on the secondary market skyrocketed. Yet, as soon as I finished profusely thanking my wife for her amazing act of love (the tickets, remember? ), I called my mom to invite her to the big game which was set to take place in five days. After thinking about it for about a tenth of a second, my mom excitedly accepted my invite and we talked about plans for her upcoming visit. As the day of the game drew closer the fans in Madison grew more and more excited as the anticipation of the showdown for the conference title and inside track to the Rose Bowl reached a fever pitch. (I’ve read way too many sports articles in my time, can you tell?) Decked out in our Badger red we arrived to the stadium area early and grabbed a quick bit at the house of friends who lived across from the stadium and had invited us to their pregame party. (I’m pretty sure I could eat brats for every meal and never grow weary of it.) As we walked up the steps into the stadium I could sense my mom’s anticipation and enthusiasm growing, much like a kid on Christmas morning. Only this present was going to be shared with over 75,000 loud and probably drunken fans, unlike our family Christmas experiences. Following my lead (it helps that I’m 6’8″) through the crowds we found our seats in the south end zone and watched the players finish their warm-ups before the famous Wisconsin Marching Band put on a spectacular pre-game show. If memory serves me right, there was a fly-over by some sort of military jets after the national anthem, which sent the crowd into another loud round of cheering. The game hadn’t even started and the atmosphere was completely electric. My mom’s face was one HUGE grin and she gave me a quick hug as the teams lined up for the opening kick. Badgers fans know what happened next. The Wisconsin player (David Gilreath, and no, I didn’t have to look it up) caught the ball at the goal line and returned the opening kickoff all the way back for a touchdown. Right in front of us! Since no one in the stands was yet seated we all erupted in even more cheers and high-fives and hugs as this was the most unbelievable start imaginable. The Badgers dominated the rest of the first half and withstood a rally by the Buckeyes in the second half to win one of the biggest and most memorable home games in recent memory. As the final seconds ticked away the fans rushed the field and began to dance and celebrate with the players. I love how this picture captures the joyful celebration on the field behind us and the fun moment and memory that we shared that night at Camp Randall. After watching the thousands of people on the field for a few minutes my mom and I eventually headed down there ourselves. It was pretty wild and crazy scene with a lot of people running all over the place and getting pictures and just soaking in the good feelings from a great win by our Wisconsin Badgers. We still reminisce about that great game from time to time, mostly whenever Wisconsin faces Ohio State in football. On Wisconsin! I was recently nominated by my fellow Stay At Home Dad and Dad Blogger friend R.C., who writes at Going Dad, to participate in a challenge called Five Photos, Five Stories, in which I post a photo and story (fiction or non-fiction) daily for five consecutive days. It sounded like something that would be a fun to share with my loyal readers here on my blog. If you would like to be nominated please leave a comment below and I would be happy to oblige. 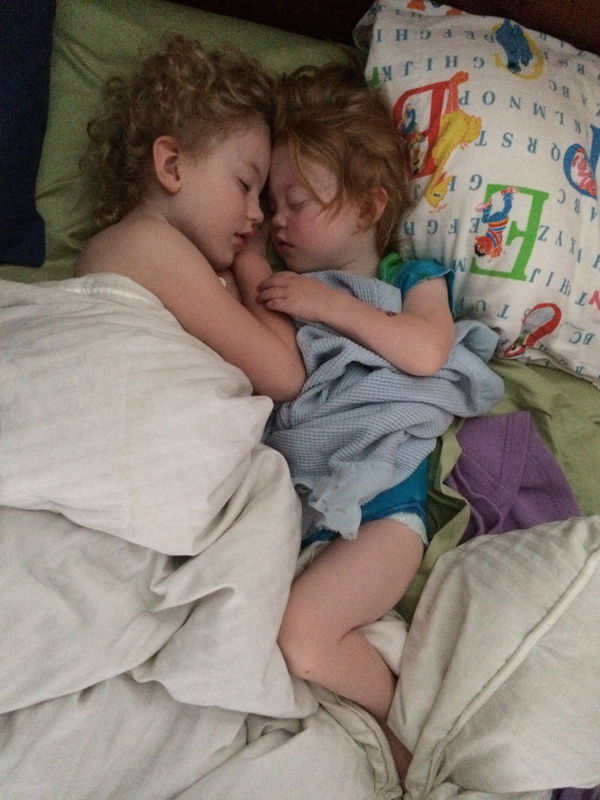 These two sleeping beauties will each celebrate a birthday in the next ten days, turning 5 and 2. As a SAHD I have had the privilege to watch their relationship grow closer and closer over the last couple of years. While they can squabble like any siblings do, they have become pretty good buddies. Little sister J absolutely adores big sis M and loves to do pretty much anything that she is doing. Dress up, dolls, puzzles, reading, art, dancing, swimming, playing at the park or YMCA, and watching football and making cookies with Daddy. They love to do life together. I’m so excited to watch these two grow up together, although I’m slightly nervous about the mischief they’re going to make together in about 10 years. I snapped this photo of the two of them snuggled in bed together yesterday morning. They slept most of the night in that sweet embrace. When my wife and I decided to try to add on to our already-large family of four kids back in 2009 it was with the hope that we could have two more kids who could become friends since there would be an almost six year age gap between kids 4 and 5. At this point it appears that our hopes and prayers are being answered in the most spectacular way possible. I cannot imagine our family without these two little girls. God obviously knew what he was doing when he blessed us with them.